Digimon Adventure 02: Diablomon Strikes Back (デジモンアドベンチャー０２ ディアボロモンの逆襲, Dejimon Adobenchā 02 Diaboromon no Gyakushū) is the fourth Digimon movie and is the second movie of Digimon Adventure 02 (Dub: Revenge of Diaboromon). 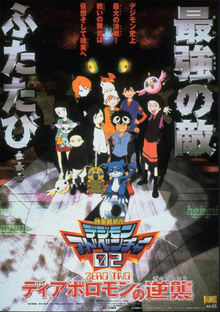 It premiered on March 3, 2001 alongside One Piece: Clockwork Island Adventure (ＯＮＥ　ＰＩＥＣＥ　ねじまき島の冒険, Wan Pīsu Nejimaki-jima no Bouken), which was preceded by the animated short Jango's Dance Carnival (ジャンゴのダンスカーニバル, Jango no Dansu Kānibaru), as part of the 2001 Spring Toei Anime Fair. Once again, Diablomon is reaking havoc on the internet, sending emails to many people, with an attached picture of a young Taichi or Yamato, as well as a Kuramon, Diablomon's Baby I state, which will escape into the real world upon viewing the email. Fearing that Diablomon wishes these copies to evolve and cause harm in the real world, Taichi and Yamato, along with Omegamon, are sent again to defeat this threat, where as the rest must round up the Kuramon and delete them before they pose a threat. Omegamon finds difficulty in defeating Diablomon until aid comes in the form of Angemon and Angewomon, who hold down Diablomon to be destroyed yet again by Omegamon's Grey Sword and Garuru Cannon. Unfortunately, the Kuramon that have escaped from the internet into the real world fuse together to become the strongest threat the kids have ever faced, Armagemon. Through the power of Angewomon, Omegamon, Yamato and Taichi are able to escape and the two Ultimates face off in combat. However, Omegamon's powerful shots seem to have no effect, and when attacked at point blank range, he is defeated. Refusing to give up hope, V-mon and Wormon quickly jogress into Imperialdramon, who is defeated even faster. Losing hope and out of options, the kids are practically ready to accept defeat when Omegamon valiantly gives what power he has left to form the Omega Blade, allowing Imperialdramon to evolve into his Paladin Mode. Imperialdramon quickly destroys Armagemon with this powerful new weapon, and with the help of the Digivices and Cell phones of the people who watched the fight, the remaining Kuramon are deleted, allowing the now exhausted children and Digimon to rest. The movie ends with a photo of the chosen children, presumeably on the same trolly that brought the original kids home at the end of of the first Adventure. This page was last modified on 25 November 2015, at 09:03.